Charges brought by prosecutors accusing journalist Zenzele Ndebele of being in possession of "offensive weapons" after a search of his vehicle turned up a spent cartridge and a used tear gas canister "defy logic", a magistrate ruled on Friday. Ndebele, arrested at the Bulawayo State House on Thursday while attending an event hosted by President Emmerson Mnangagwa, walked out of the Bulawayo Magistrates Court a free man after charges of "possession of offensive weapons at a public gathering" and "criminal nuisance" were quashed as incompetent by magistrate Franklin Mkhwananzi. "It beats logic that a used tear smoke canister and a spent cartridge casing could be defined as offensive weapons, if they are weapons at all," the magistrate said before a packed courtroom, granting a defence application for refusal of further remand. "It also defies logic that a person who complied with a search of his vehicle and having items removed from it could be charged with criminal nuisance." 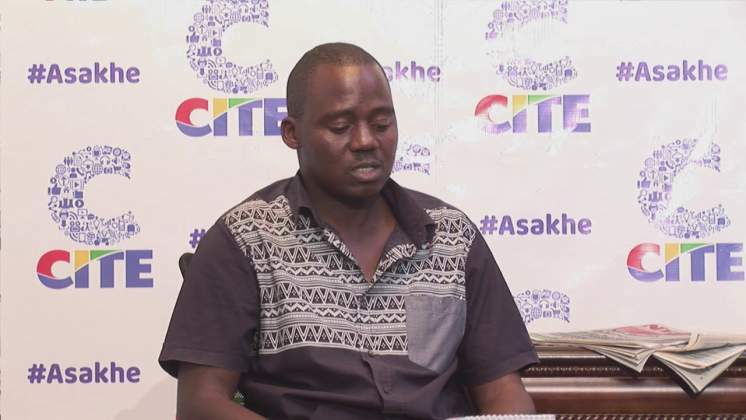 Ndebele, who is the director of the Centre for Innovation and Technology (CITE) based in Bulawayo, was represented by James Sithole of the Zimbabwe Lawyers for Human Rights. The journalist picked the shell casing and tear gas canister on January 14 while covering a military-led crackdown on fuel protests in Bulawayo, and retained them for a forthcoming documentary about security services brutality. Ndebele was initially detained with four others, including colleagues Lulu Brenda Harris and Sautsani Ali; the Reverend Useni Sibanda, Dumisani Nkomo of Habakuk Trust and Dumisani Ngwenya of the church-based NGO Grace to Heal. The five were made to sit on the ground for nearly an hour as security agents came and went, asking them details about where they work and where they stay, Harris told ZimLive. Eventually, Ndebele was charged and his passengers let go, Ali being the last to be released. On Friday, Harris was called in by the police and attended with her lawyer. She met the officer in charge at Bulawayo Central Police Chief Superintendent Elizabeth Phiri who told the journalist they had information that she was planning a demonstration outside the Tredgold Magistrates Court where Ndebele was due to appear. "They told me there were procedures to be followed before holding a demonstration, and lectured me about responsible reporting. I had planned no such demonstration and I could have done without the journalism lesson. They let me go," she said. Ndebele's colleagues said his arrest was harassment for his outspoken views about Mnangagwa's role in the 1980s Gukurahundi genocide in Matabeleland. Ndebele has released two documentaries about the atrocities, placing Mnangagwa at the centre of the army-led killings which rights groups say left 20,000 people dead. Mnangagwa was in Bulawayo for a meeting with over 60 civil society organisations calling themselves the Matabeleland Collective. The groups presented Mnangagwa a list of grievances, which he promised to look into.